I’ve got a kid that doesn’t eat meat. And by “doesn’t eat meat” I mean meatballs are fine and hot dogs are fine and burgers are too. But ground turkey? Nope. Chicken? Nope. Pork chops? NOPE. It’s one of the more frustrating things about being a parent. But I finally have a meatless recipe that my other kids won’t complain about. 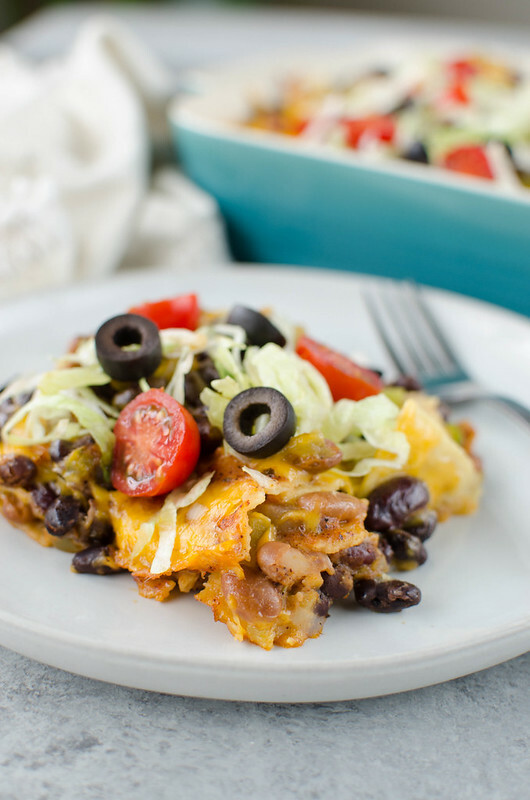 Even my kid that “doesn’t like beans” loved this Three Bean Enchilada Casserole. This is seriously such an easy dinner recipe. You can prep it in less than 20 minutes and then it just goes into the oven for 45 minutes. The bean mixture is a can of pinto beans, a can of black beans, and a can of kidney beans. And you could definitely substitute a different bean if you don’t like one of those or don’t feel like dragging all 3 of your kids to the grocery store for the 1 can of beans you forgot. And then some diced onion, diced bell peppers, and a can of chopped green chiles. 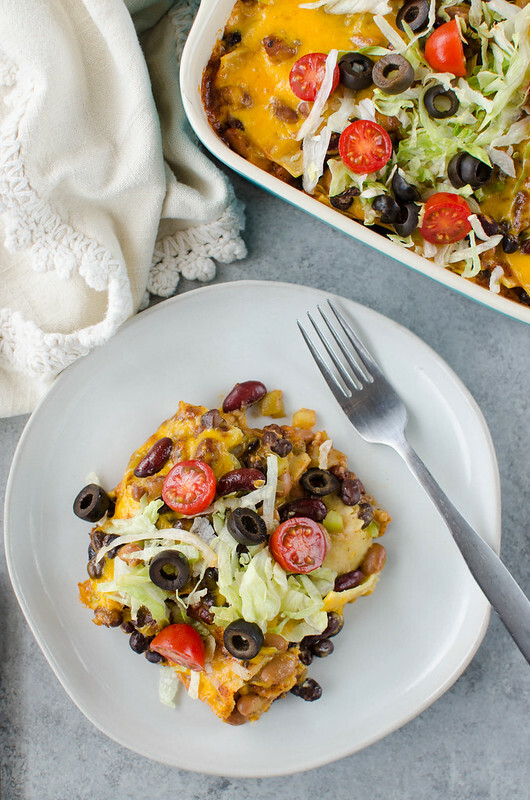 The bean mixture gets layered in a casserole dish with corn tortillas, enchilada sauce, and cheddar cheese. 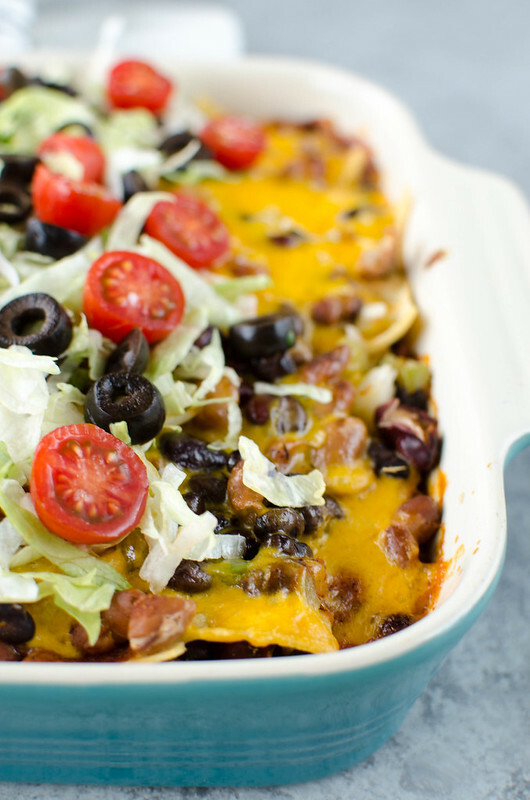 Bake that until the tortillas absorb all the sauce and the cheese gets all melty and delicious. I topped ours with lettuce, tomatoes, and olives. Sour cream and salsa would also be delicious toppings. 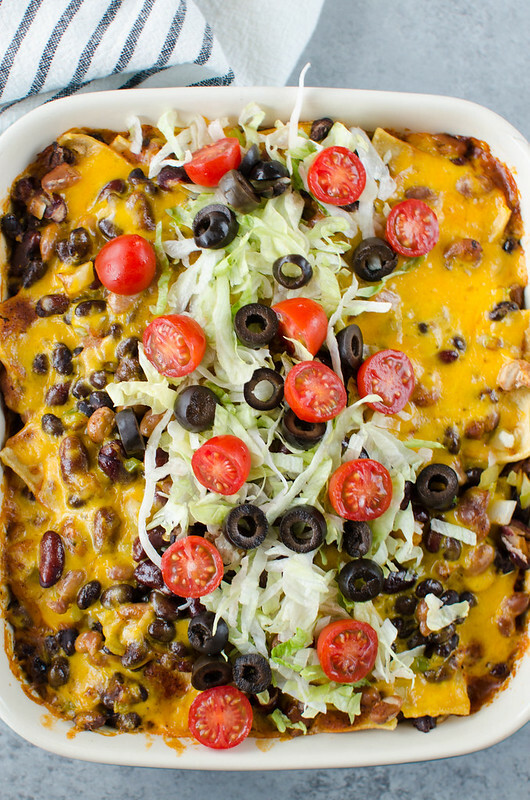 We’ll be making this one often because, not only did everyone love it, it’s also really budget-friendly! And I almost always have the ingredients on hand. Cheesy Pasta with Roasted Cauliflower – pasta in a creamy ricotta and Parmesan sauce with roasted cauliflower and kale. 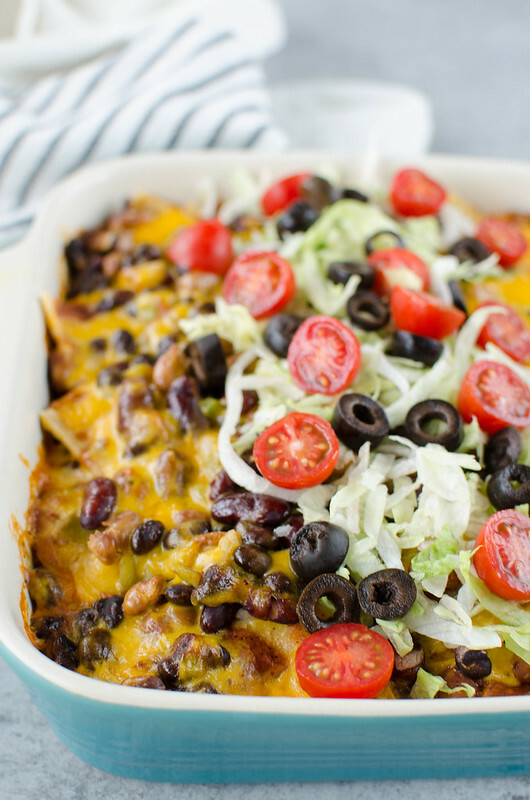 It’s an easy 30 minutes meal that’s perfect for a weeknight! Crustless Spinach Quiche – protein packed and so simple! This quiche would be great for meal prep. Thai Mushrooms Lettuce Wraps – sauteed mushrooms in a sweet and spicy sauce, wrapped in crisp lettuce. Low carb and delicious! Preheat oven to 350F. Spray a 2 quart casserole dish with oil. In a mixing bowl, stir together onion, bell peppers, beans, and diced green chiles until well combined. Spoon 1/3 cup of the enchilada sauce on the bottom of the dish and spread to all the corners. Spread 3 of the corn tortillas over top; followed by 1/3 of the bean mixture. Drizzle 1/3 of the remaining enchilada sauce over the beans and sprinkle with 2/3 cup cheese. Repeat layers, leaving off the final cheese layer. Bake, covered, for 35 minutes. Sprinkle with the remaining cheese Bake 10 minutes, or until cheese is melted. Top with shredded lettuce, diced tomatoes, and olives, if desired. 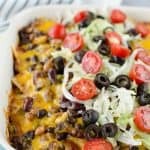 One Response to "Three Bean Enchilada Casserole"